The Dinosauria (see cladogram) consist of two main clades (Gauthier, 1986; Benton, 1990a; Sereno, 1999), the Saurischia and Ornithischia. The Saurischia fall into two main clades, the Theropoda and Sauropodomorpha. Within Theropoda, the main outlines are widely agreed, with the coelophysoids and ceratosaurs near the base, then various larger flesh-eating groups (e.g. megalosaurids, allosaurids, spinosaurids), then tyrannosaurids and maniraptorans (troodontids, dro-maeosaurids, birds). Much of the detail is controversial. We use here the most thorough recent analyses of theropod relationships: Rauhut (2003), for the outline of major theropod groups, and Clark etal. (2002) and Maryanska et al. (2002) for maniraptorans and basal birds. Sereno (1999) regards herrerasaurids as basal theropods, whereas they are indicated as basal saurischi-ans here (Langer et al., 1999). Earlier authors (e.g. 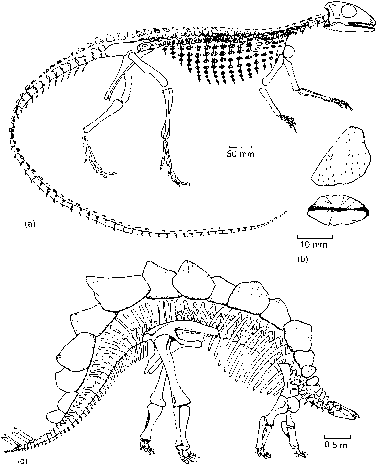 Gauthier, 1986; Holtz, 1994; Sereno, 1999) recognized a broad-based ceratosaur clade, whereas Rauhut (2003) finds that coelophysoids and ceratosaurs are successive outgroups. Holtz (1994) identified a major theropod clade, termed the Arctometatarsalia, that included tyrannosaurids, ornithomimids and troodontids. This is not accepted here (Rauhut, 2003). Among Maniraptora (Gauthier, 1986), major changes have been the move down the tree of the alvarezsaurids (Chiappe et al., 2002), formerly regarded as fully-fledged birds, and the move of oviraptorosaurs into Aves (Maryanska et al., 2002). Sereno (2001) pairs alvarezsaurids with ornithomimids, but we retain them simply as an outgroup on the main stem to birds. The Sauropodomorpha includes the Triassic and Jurassic Prosauropoda, possibly a clade, or more probably a sequence of outgroups to Sauropoda (Yates, y 2003b). Within Sauropoda (Upchurch, 1998; Curry Rogers and Forster, 2001; Wilson, 2002), the Early and Middle Jurassic vulcanodontids and euhelopodids are outgroups to six major families of giant sauropods, mainly Late Jurassic to Cretaceous in age. The Ornithischia (Sereno, 1986, 1999) have a possible primitive member, Pisanosaurus, and two main clades, the Cerapoda and the armoured Thyreophora, jointly the Genasauria. The Early Jurassic fabrosaurid Lesothosaurus is an outgroup to the Genasauria. The Cerapoda include a series of unarmoured bipedal or-nithopods of the Jurassic and Cretaceous, leading to the hadrosaurs, as well as the horned ceratopsians and bone-headed pachycephalosaurs, which together make up the Marginocephalia. The Thyreophora consists essentially of the Stegosauria and the Ankylosauria, with Scelidosaurus and Scutellosaurus, Early Jurassic forms, as basal representatives. ridge on outside, wrist bones fused, spiked thumb, digits 1-4 of hand reduced, digit 5 of foot absent, ossified tendons extend from base of neck to middle of tail. trunk have high neural spines for the attachment of powerful muscles to hold the head up and there are bundles of ossified tendons over the hips. The real variation is seen in the skulls: some forms such as Centrosaurus (Figure 8.17(d)) have a simple horn formed by fused nasal bones, whereas others have this and a pair of'horns' on the jugals. The frill may be short or long and indeed Torosaurus had a skull 2.6 m long in which the frill is longer than the rest of the skull, the largest skull known from any land animal. The frills and horns may have been used in defence and as visual species-signalling structures as well as in threat dis plays. Male ceratopsians may have engaged in head wrestling with the horns interlocked, just as deer do today. Jurassic, such as Scelidosaurus from England (and reported also from North America and China) and Scutel-losaurus from Arizona, USA (Colbert, 1981), and the more familiar larger groups Stegosauria and Anky-losauria that radiated in the Middle Jurassic. 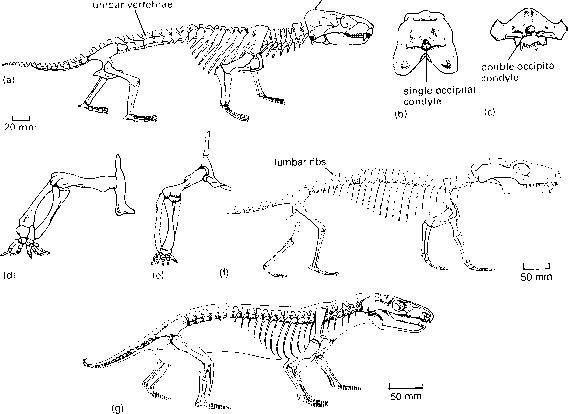 Scutel-losaurus (Figure 8.18(a)) is a modest-sized biped, with a skeleton similar to that of Lesothosaurus (Figure 8.11(c)), but it has numerous rows of keeled scutes (Figure 8.18(b)) over the back and in regular rows on the flanks. Typical stegosaurs, such as Stegosaurus from the Upper Jurassic of North America (Figure 8.18(c)), have low, almost tubular skulls. The hindlimbs are much longer than the forelimbs, evidence of a bipedal ancestry, and the massive arched backbone supports large triangular bone plates that sit in a double row. The arrangement of the plates has been debated: was there a single row or two? This was hard to determine as the bony plates developed independently within the skin and did not meet the bones of the skeleton at all, but were presumably held firm by massive ligaments. A well-preserved specimen, with the plates in position, confirms the double, alternating row (Carpenter, 1998). plates fitted engineering design models for heat-dissipation structures. As with the sails of the pely-cosaurs (see p. 121), Stegosaurus could have modified its body temperature by adjusting the blood flow to the fins and its orientation to the wind. An overheated animal could cool down rapidly by pumping high volumes of blood over the plates and standing broadside on to the prevailing wind. Like the stegosaurs, the ankylosaurs (Coombs, 1978) arose in the Mid-Jurassic, but they are not well known until the Early Cretaceous. 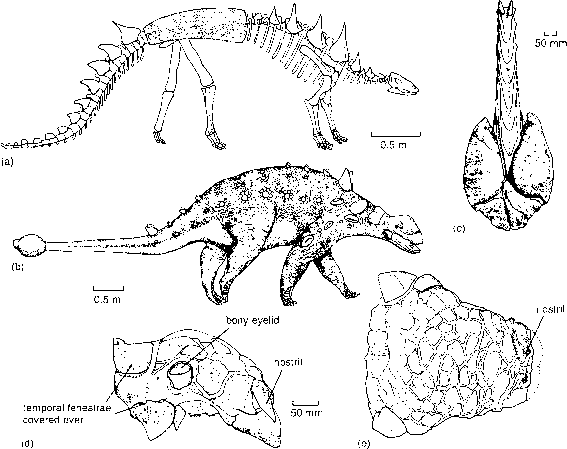 Polacanthus, a nodosaurid from southern England (Blows, 1987), is a typical early form with a mixture of spiny plates along the flanks and a fused mass of smaller plates over the hips (Figure 8.19(a)). The ankylosaurids such as Euoplocephalus and Ankylosaurus (Figure 8.19(b-e)) have broad armoured skulls and a body armour of plates rather than spines covering the neck, trunk and tail. 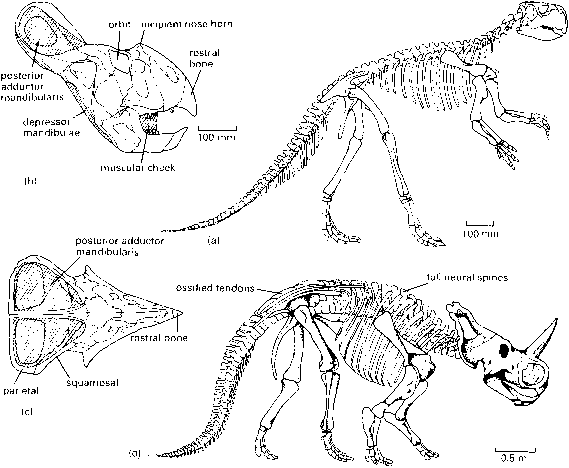 Ankylosaurids also have massive bony bosses at the ends of their tails, formed by the fusion of the last caudal vertebrae and the incorporation of bony plates from the skin (Figure 8.19(c)). A blow from this club would readily disable Tyrannosaurus or any other contemporary predator. The ankylosaur skull (Figure 8.19(d, e)) is a heavy box-like structure with massive overgrowths of the normal bones of the skull roof by a mosaic of new bone plates generated within the skin over the head. These cover the upper temporal fenestra in all genera and the lower one in most. Only a small orbit and nostril remain and even they are heavily overgrown.